Computer Systems Odessa is the creator of the ConceptDraw project management software suite. Formed in 1993, Computer Systems Odessa’s products include server solutions, games, and productivity tools. The company is a Software 500 company and has over 500,000 customers. Their partners include Google, Evernote, and SAP. Headquartered in San Jose, California, the company also has technical support offices in Europe. Computer Systems Odessa emphasizes ConceptDraw’s usability across a wide range of industries. The basic ConceptDraw Office tool is the mindmap application. However, ConceptDraw Office has many different business productivity tools that can be combined in whatever manner a client wishes in order to build a custom project management solution. With diagrams and charts, internal hyperlinks, as well as the ability to display external content embedded, ConceptDraw’s suite makes is a dynamic and powerful project management software solution. ConceptDraw Office can be used creatively for task management, but the mindmap application is more suited to collaborative working, as the near-infinite scrolling allows team members to pick sections and sub-topic without interrupting another teammate’s work. The mindmap is a platform best used for projects with strict hierarchies and complex relationships. It is ideal for brainstorming and the visual representation of ideas. As a business productivity tool or a project planning tool, ConceptDraw Office can be used in the ‘before’ and ‘after’ phases – the idea and analysis phases, respectively – rather than during execution. ConceptDraw Project, however, is all about the execution. 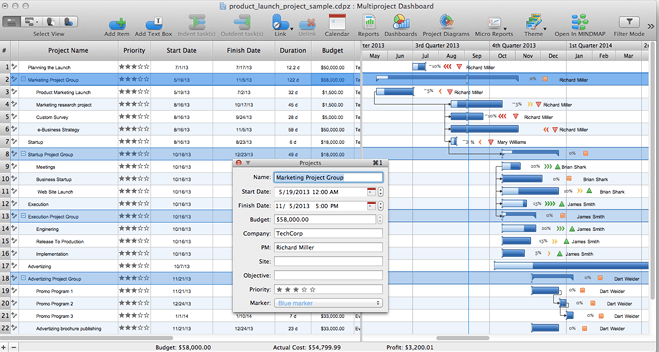 It integrates with other ConceptDraw Office products easily, has Gantt charting capabilities, and customizable resource views. By making using of the full range of ConceptDraw project management tools, a business can have an extremely detailed approach to the planning and execution of projects. Learn everything you need to know about ConceptDraw. Our experts will reach out to you shortly.